I'm not sure about those of you who live in the U.S., but here in Ontario, fresh local strawberry season is still in full swing and I'm loving being able to use them in drinks, baked goods, yogurt parfaits, and even salads. A new discovery for me this year is roasted strawberries. If you haven't tried roasting strawberries before, I highly recommend it! The strawberries start to break down in the oven and get nice and soft and gooey inside, with an intense flavour. They make a great topping for crostini, but you can also add them to salads and grains like you would with fresh strawberries. 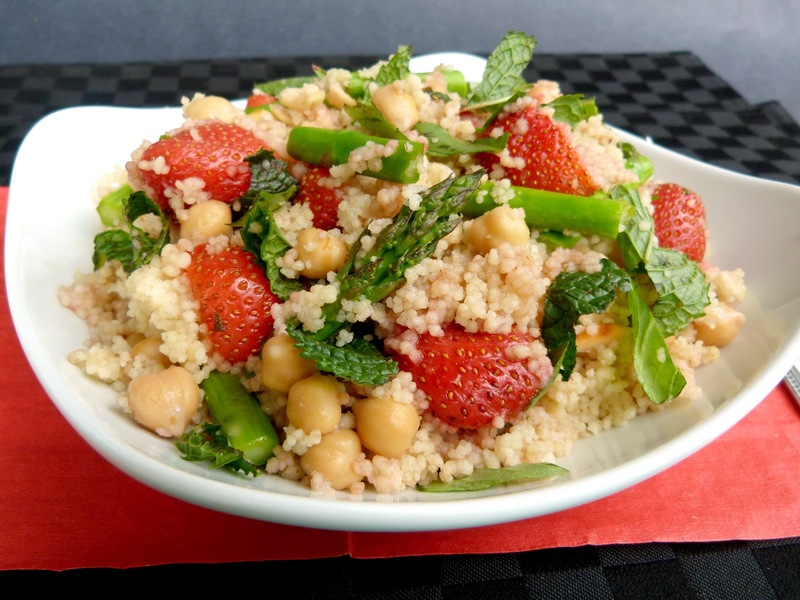 This couscous dish is a great way to incorporate roasted strawberries. 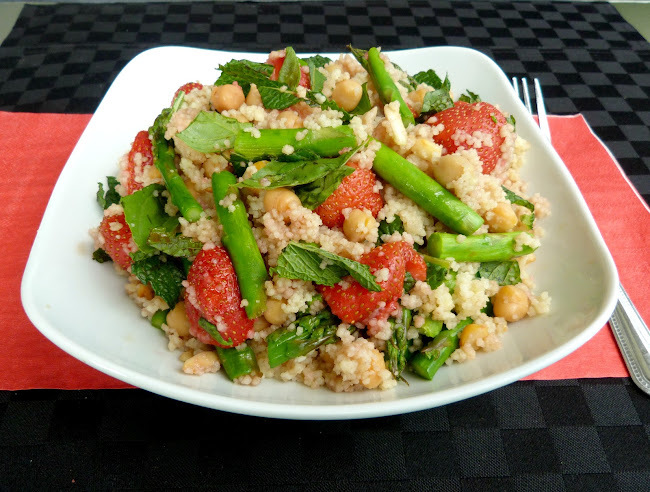 The original recipe that inspired this dish had a combination of fresh strawberries with couscous, chickpeas, goat cheese and basil, as seen on Prevention RD. I was planning on making this dish until I saw a recipe for israeli couscous with roasted strawberries on Running to the Kitchen. So I changed my plan and made my couscous with roasted strawberries instead. I also left out the goat cheese and added asparagus and fresh mint to the salad as well. I thought this was a light and nicely balanced meal with the veggies, fruit, chickpeas and fresh herbs and it made a great lunch to bring with me to school. I also loved the balsamic dressing, although the flavour didn't come through that strongly once everything was mixed together. If you want more of a balsamic taste, you can add another tablespoon to the dressing, or just drizzle some over each serving when you eat it, like I did. Hopefully strawberry season hasn't ended yet in your area so that you can try this recipe! And I still have another strawberry recipe coming up next week, so stay tuned! Toss strawberries with the maple syrup and 1 tablespoon of the balsamic vinegar. Place in a small baking pan and roast in the preheated oven for 10-15 minutes, until soft. Snap the woody ends of the asparagus and discard. Place the asparagus on a baking sheet and drizzle with a bit of olive oil, salt and pepper. Add to the oven for the last 5-7 minutes of the roasting time, until crisp-tender. Remove from oven and chop into pieces. Meanwhile, prepare the couscous according to package directions. Toast the almonds in a dry skillet over medium heat for a few minutes, until lightly browned and fragrant. Transfer couscous to a large bowl and add the toasted almonds and chickpeas. Toss to combine. Whisk the remaining balsamic vinegar and olive oil together. Pour over the couscous mixture and stir until incorporated. Stir in the asparagus, roasted strawberries (with their juices), basil and mint. Season with herbamare and ground pepper to taste (I also liked to drizzle more balsamic vinegar over top of each serving). This was submitted to Ricki's Wellness Weekend at Diet, Dessert & Dogs. I don't think I've roasted strawberries before... I am so intrigued! It is a shame strawberries don't last long when fresh! I know - whenever I buy them, I have to try to incorporate strawberries into as many meals and snacks as I can over a span of just a few days...but I never get sick of them! I keep reading about roasted strawberries! I really need to try them. Although I think it may be too late for local strawberries here. :( We're already onto peaches! Oh, you should definitely try them! You really seem to be ahead of us with all your produce this year...first with asparagus, then strawberries, and now peaches! This looks so fresh and summery! I don't think I've seen asparagus and strawberries together before! Thanks! 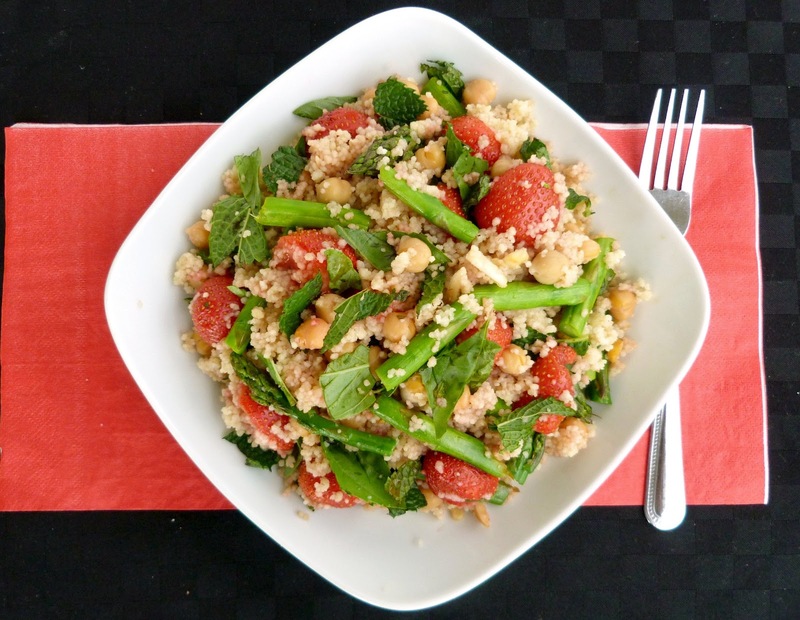 Strawberries seem to pair well with lots of green foods - spinach, kale, peas, basil, mint, kiwi, and asparagus too! Wow, the flavor combo sounds absolutely amazing! Roasted strawberries sound amazing! Thanks! I may even like roasted strawberries better than fresh now! Yes, you should definitely try them! I loved having this for lunches - it held up well and reheated fine too. I love everything about this recipe - I never tried roasting strawberries before, definitely geiving this a try! Oh wow.. I've never tried roasting strawberries before! Don't have couscous so trying it with quinoa for dinner tonight! Thx for the excellent recipe.